"The After Hours", starring Kim Fields: A young woman goes gift shopping at a department store and buys a thimble. When the store closes, she is trapped on the ninth floor - even though no such floor exists. "Mr. Dingle, the Strong", starring Tim Kazurinsky. A timid vacuum cleaner salesman is given super strength in a Martian experiment. He eventually returns to normal - at least for a brief time. "The Lonely", starring Mike Starr. A man convicted of murder is sentenced to spend 40 years on a distant asteroid in complete solitude - that is, until a sympathetic ship captain brings him a female robot companion. "Mr. Garrity and the Graves", starring Chris McDonald. Jared Garrity makes a living resurrecting the dead in the Old West. He doesn’t make money from those who want people brought back to life but from those who want the dead to stay just where they are: six feet under. "Of Late I Think of Cliffordville", starring H. M. Wynant. William Feathersmith, a bored, evil, wealthy businessman, gets a chance to go back in time and start over, armed with all the knowledge he's acquired - an arsenal that's not as powerful as he might think. "The Bard", starring John Ratzenberger and Stacy Keach. Julius Moomer is an untalented would-be television writer whose career takes off when the ghost of William Shakespeare writes his scripts for him. Shakespeare is appalled by the sponsor’s changes, including the casting of a Marlon Brando-type actor to play the lead. as a kid i watched every episode of the twilight zone reruns with my grandmother. now i listen to the radio dramas with my wife as we eat dinner. a new tradition i hope to pass on. 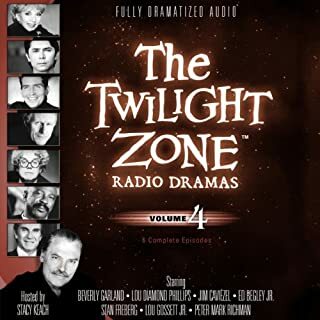 this is a solid collection of stories from The Twilight Zone, although none of them fall into the scary and few fall into strong science fiction. Most of these episodes are overly comic but well adapted from the series. The Lonely starting Mike Starr is a standout. 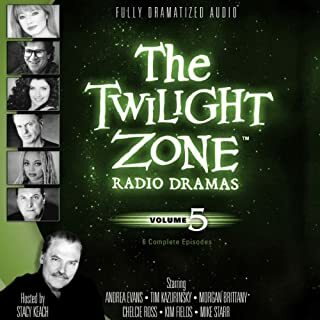 What a wonderful show "The Twilight Zone Dramas"
Almost as good as the TV series! 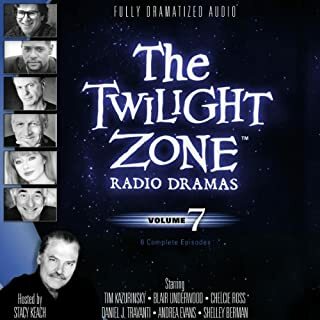 Great performances along with the standard TZ music makes these stories a joy to listen to. If this was a book to hold, I couldn't put it down! I mean this is one of few thrillers I genuinely appreciate! 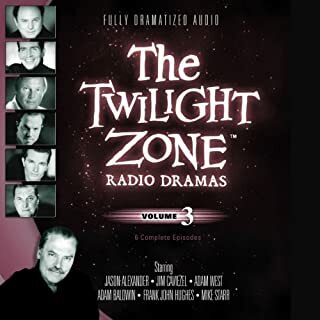 I adore The Twilight Zone and am absolutely over the moon to have found this audio series! I travel a lot on the weekends and this has made me looking forward to the weekends other than the other way around. You can not beat the voice actors in this collection. If I had to name my favorite in the this one... It is a hard choice. I thought Mike Starr killed it in The Lonely but the story about the guy who can bring back the dead... stellar. 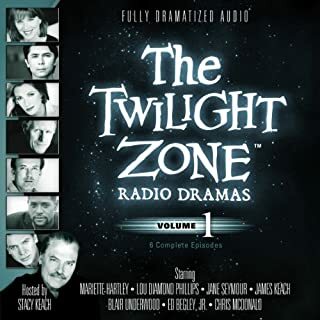 This is the perfect thing for any fan of The Twilight Zone and a good way to introduce the series for those who do not know it already. This collection isn't nearly as good as Volume One, unfortunately. Most of the stories, although all written by Rod Serling, lack gravitas; they're fun but only in a silly, almost childish way, and I tired of them pretty quickly. But two of the six radio plays included here are truly worth listening to and will stay with me. These are the first story, The After Hours (an eerie story about a young woman trapped in a deserted department store) and especially the third story, The Lonely, about a man sentenced to 40 years of solitary confinement who receives an unexpected gift just when he thinks he can't stand one more day of the excruciating loneliness. All in all, even with only 33% of this volume being truly pleasing in the way Volume One had led me to expect, I'm very glad I bought it and it was worth the credit. There are times (like recently, during long commutes home at night in heavy storms) when you need to listen to something light but lively, something you don't have to pay too much attention to but which will keep you alert on the road. 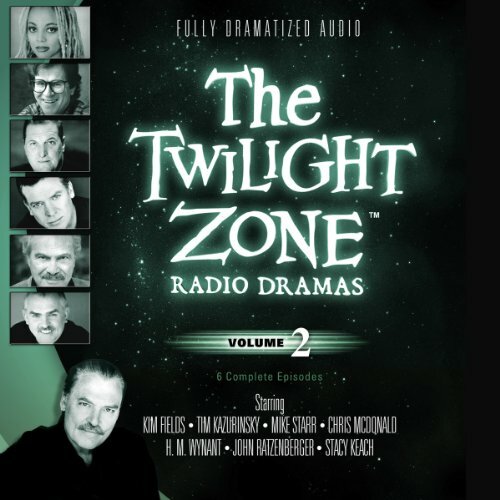 The Twilight Zone radio dramas are just the ticket! The acting and production values are all first rate, and the writing quality is unfailingly high even when the plot is feather-light. I do think I will be buying the next volume in the series. Thank you, Audible, for making these available! Not as good as season one, but still good. audio and performance were amazing. but stories were not all that enticing. The performance behind the stories is like the real show. Very glad I bought this. It was entertaining . Very good quality. Will buy another volume.